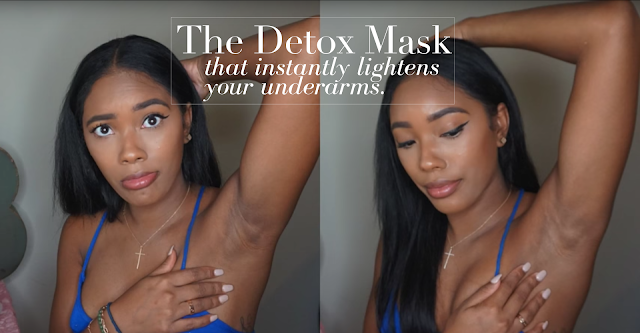 [BEAUTY HACK] Instantly Lighten + Detox your Underarms with this Simple Mask. It seems like only yesterday that I was inviting every one to try this mascara trick for bolder lashes using activated charcoal. In the past I've encouraged everyone to use charcoal in many ways including as an ingredient in your DIY facial mask and as a teeth whitener. Today, I might be sharing the most awesome activated charcoal application ever! This new technique involves pairing charcoal powder and honey to instantly lighten your underarms. It's essentially an activated charcoal underarm mask. Some say that this mask has powerful detox qualities. We all know that charcoal is the ultimate purifier which has the ability to easily absorb large amounts of impurities. Because of this, some have utilized the power of charcoal to detox the sweatiest part of our body. Located in our armpits are lymph nodes that are responsible for filtering toxins. Each morning we put on antiperspirants that prevent us from sweating & properly releasing the toxins. Perhaps it makes sense to do a detox every once in a while to remove those impurities. Not only is this underarm charcoal mask beneficial, it could actually lighten our pits giving us even toned skin all over. Best of all is how fast it works! There's no waiting for weeks to see the fruit of your consistent labor. Nope, this wonder mask produces a noticeable difference in just one application. All you do is mix a little honey and charcoal and apply. Once dry, you rinse and get to enjoy tank-top ready arms whenever you please. I've seen this mask work with normal honey but consider using manuka honey to enjoy the antibacterial properties. This honey-charcoal combo can also double as a face mask so if you have a little left over, use it on your skin. I first heard of this beauty hack when someone left a comment mentioning that she was giving this mask a try. After a little hunting, I found a couple of videos that demonstrate just how awesome and effective this treatment is.